This is a quick and easy all-in-one meal soup. 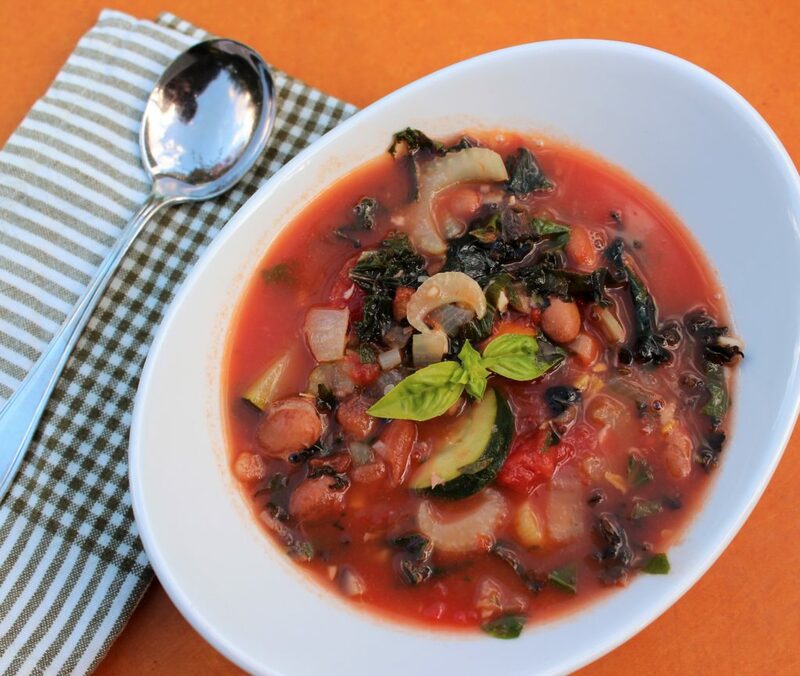 It’s packed with nutrient dense ingredients like tomatoes, carrots, onions, garlic, kale, whole grain pasta and cholesterol lowering beans. I made this on Breakfast TV one morning and the crew gobbled it up. A true testimonial – eating beans at 8:00 a.m.; it’s was either delicious or the crew were out of their minds. I’m going with it was delicious. Heat a large pot over medium heat; add the oil and the onion and sauté till almost cooked, approx. 5 minutes, stirring often. Add the carrots and the garlic. Sauté for 3 minutes, stirring often. Add the tomatoes, beans, chicken stock and the water. Bring to the boil. Add the kale, whole wheat rotini, red pepper flakes and pepper. Bring back to the boil, cover, reduce heat to simmer and cook for 8-10 minutes or until the pasta is just cooked. Add the basil and balsamic if using, stir and serve. If desired sprinkle with parmesan cheese.